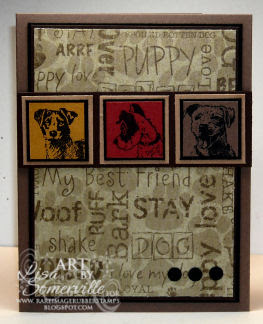 I just love the dog images from Rare Image Rubber Stamps Pet Sheet. How could you resist those faces! While I was at Hobby Lobby last week, I found the perfect DSP by The Paper Studio to go with these images - isn't it cute! My sketch is this weeks SCS Sketch, I can see using it for a lot of the images that I have, and even rotating the sketch. Here I used the images stamping them with the Warhol Technique (yep, another one of my favorite techniques).